I wish I had more time to relax, take baths and pamper myself like the rich and famous, but suffice it to say, I just don't. Every once in a great while I will relax in a bath, but until I invest in sound proof walls, and a sound-proof door, it's not going to be as relaxing as it looks on TV. Luckily, I recently received some incentive to get myself in the tub (and some ear plugs to keep the noise at bay): Adovia Dead Sea Bath Salts! Dead Sea Salts are more unique than your typical Epsom Bath Salts because of their higher mineral concentration. As you know, our body utilizes several different vitamins and minerals on a daily basis. 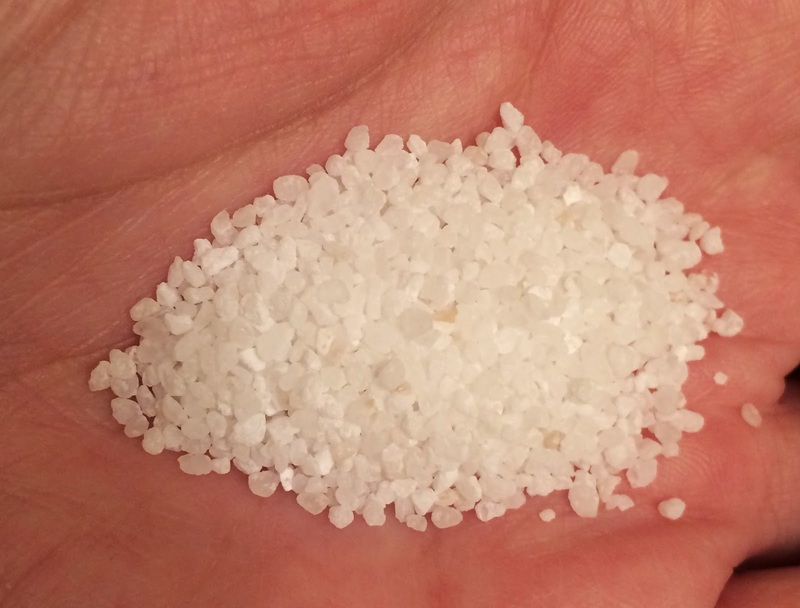 Whereas Epsom salts contain high concentrations of magnesium and sulfates, Dead Sea salt contains a variety of minerals including: magnesium, potassium, calcium chloride, sodium and bromide. These minerals can be absorbed into the skin during use, and be used by the body to combat some common issues such as psoriasis, eczema, arthritis and overall muscle soreness. 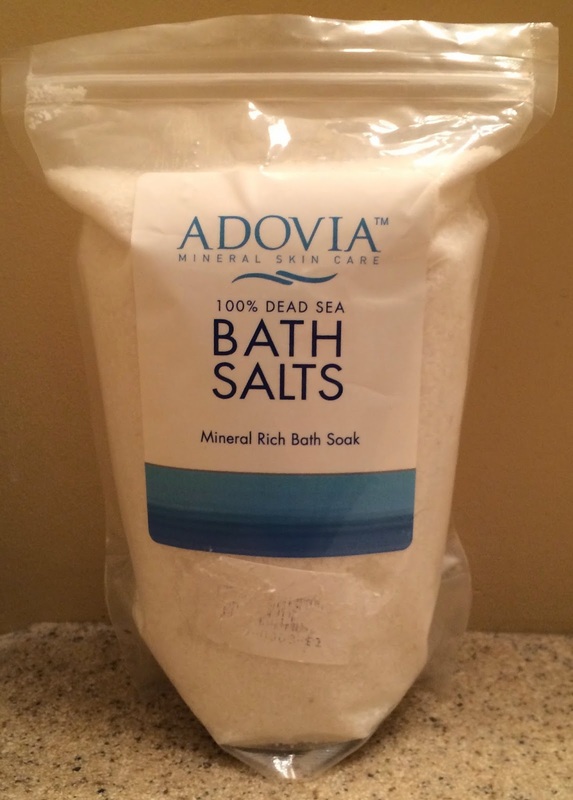 The Adovia Dead Sea Bath Salts are very easy to use when adding them to your bath. All you do is add 1 cup of the salt to your running, or already drawn tub. You soak in the dead sea mineral goodness for 20 minutes, rinse off with warm water, and you are good to go. This can be done as frequently as everyday! I am not much of a bath-taker because I rarely have 20 minutes of down time, let alone 20 minutes of ALONE time. Because the Adovia Dead Sea Bath Salts are free of fragrance, color or additives, I have been able to incorporate this into my daily routine in other ways. For example, I add this to my body wash to give my dry, flaky skin some extra exfoliation while we battle the freezing temps. I do the same with my face wash, as my facial skin appreciates the extra scrub. The salt is like a medium-grain, so it is not so fine that it dissolves immediately, but when I mix it with gel cleansers it provides a simple and gentle exfoliation - eventually it all does dissolve. I really love it. I have also been sneaking it in when I wash my hands too. I love the feel of super-soft exfoliated hands, and this does the trick. If you wish to purchase your own 1.75 lb resealable pouch of Adovia Dead Sea Salt you can do so on Amazon HERE for a mere $11.95. As always, this price may change at anytime. My grandmother is a tea drinker, as is my own mother. I align more with coffee drinkers, however, I do enjoy tea as well. Since I was a kid we have always had stove-top tea kettles to address our water boiling needs. Every year when my grandmother comes to visit she always comments on how long it takes for the water to get hot with the stove-top tea kettle, as she is used to the much quicker electric tea kettle that she has at her house. She has been trying to get my mom to switch to an electric kettle for YEARS, and has even offered to buy her one. My grandmother was recently staying with us as she recovered from a fall that broke her heel (did you know that you can break your heel? ), and shortly after she left, in pure irony, I received this beautiful Epica 1.75 Quart Cordless Electric Stainless Steel Kettle to review. First things first....This kettle is gorgeous! I love the look of it, and feel that it would fit in on any kitchen counter top. The stainless steel look is a compliment to any kitchen scheme, making it an easy kitchen appliance addition to any home. Second, it certainly boils water quicker than any stove-top kettle I have ever encountered. This is a plus for me, as I have little patience and more importantly, sometimes my son decides he want oatmeal for breakfast 15 minutes before he is supposed to leave to catch the bus. Sometimes we cut it pretty close... The Epica 1.75 Quart Cordless Electric Stainless Steel Kettle is extremely easy to use too. It comes with a small round base which plugs into an outlet. You pop open the top of the kettle to fill it, and set it back onto the base. Just under the handle is the power switch. When you press it down it turns blue to signify that it is on and heating up. Once the water is boiling, this will automatically switch back up into the off position, and the light will turn off. Once the water has boiled, you can lift the kettle off of the base and take it wherever it is needed. This is so convenient if you are entertaining! Even more convenient is the easy-to-read water level gauge placed directly behind the handle. So far I have no complaints about this Electric Kettle, and I am excited for my grandmother to come visit so her tea will be ready in no time at all! 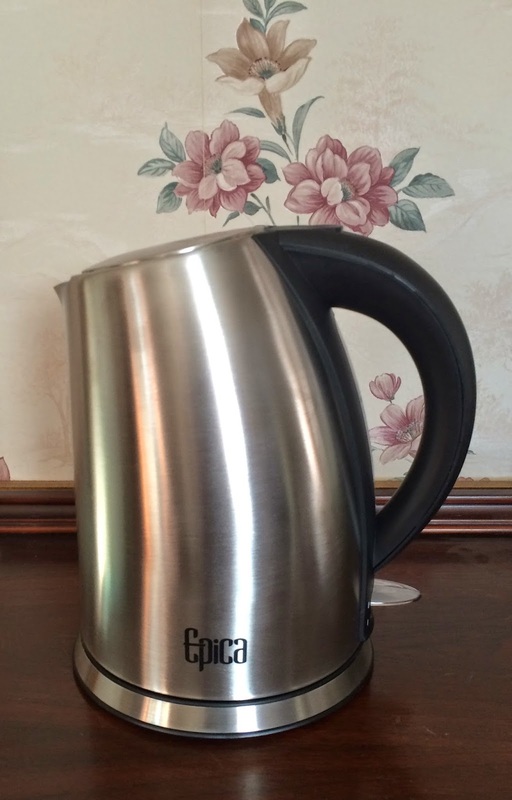 If you use hot water frequently, I would highly recommend the Epica 1.75 Quart Cordless Electric Stainless Steel Kettle. I'm not a major tea drinker, but this can be used for people who use coffee presses, eat "just add hot water" meals, enjoy oatmeal or cream of wheat and also, I use boiling water when I clean, and I have to say that this makes getting hot water an absolute breeze. This kettle has been a real time-saver! If you are in the market for an electric kettle, I would highly recommend this one, and you can get it from Amazon HERE. (It is currently out of stock, but when it comes back into stock, I will update with a price). Cleaning my face is an insanely important part of my skincare routine. I suffer from hormonal-based acne breakouts, so I have to be very careful about what I put on my face. Minor changes often result in breakouts or inflammation of current blemishes.... Sometimes I feel like my face is some strange science experiment. That being said, I love getting to try out new beauty tools that supplement my routine without creating aggravation. 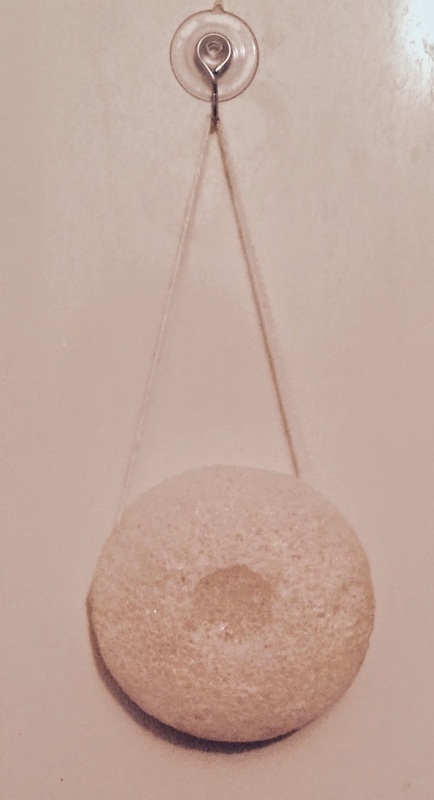 Many skincare brands have recently introduced Konjac Sponges to their lines, and I have to say, I am a huge fan. I have tried a few different ones, and I am currently loving my La Lune Naturals Pure Konjac Cleansing Sponges. If you are unaware, a Konjac Sponge is an exfoliating sponge used to cleanse the face. I'm sure you could probably use this on your body as well, although I would not recommend using the same one on your body that you plan to also use on your face. Just my opinion though, feel free to do what you like, no judgement! My skin thrives from exfoliation. I could use a scrub every single day, and the dermatologist would tell me it is OK, because my face literally has NO bacteria on it. I have had a special analysis done at the dermatologist before and they said they normally discourage the use of face scrubs regularly, but because my skin was so clean, they told me to do whatever I wanted. When I feel that my face needs a break from the abrasion of a scrub, I use my La Lune Naturals Konjac Sponge with a regular cleanser and I still walk away with clean, baby-soft skin. Even better, these Konjac sponges are made free of chemicals, parabens and sulfates, while also being biodegradable! Its made from the highly sustainable Konjac plant, whose fibers work hard to pull away the toxins and impurities that dull our skin. Plus, the Konjac sponge itself is very lightweight and therefore gentle. There are a couple of reasons why I keep this baby hanging around the bathroom. One, when I treat my acne, it gets dried out and therefore flaky. No one likes to look like they have Leprosy, including myself, so I use my Konjac sponge to gently remove the "flakies" from my face without further irritating my breakouts. And second, my skin is dry in the Winter and doesn't need further aggravation, so I use fewer scrubs and more gel, cream, and liquid cleansers with my Konjac sponge to get my desired outcome. And lastly, it does a wonderful job at removing make-up from my skin at the end of the day, so that is an added benefit. If you are interested in adding a Konjac Sponge to your beauty routine, I highly recommend the La Lune Naturals Konjac Sponges. The package contains 2 sponges, and a mini suction cup with a hanger for you to keep your sponge fresh in the bathroom. Right now, they are priced at $12.99 on Amazon, HERE, meaning you are getting them for about $6.50 a piece. La Lune Naturals offers quite a variety of products which you can check out on their website, and keep up with them on their Facebook page! I am a lover of face masks. I admit it, take me to Face Mask Lovers Anonymous, it is a real problem! My closet and bathroom are overrun by masks and beauty products, but honestly, I wouldn't have it any other way! The thing is, they are each so different, and provide different benefits. I think I have enough face masks that I could wear one per day for 2 weeks straight without repeating. A tad ridiculous, but nonetheless, I always have a mask to address whatever issue my face is having at that moment. That being said, there is a new ingredient that seems to be making it's way to the forefront of the DIY mask making beauty scene, and I got my hands on it! Introducing Majestic Pure Cosmeceuticals 100% Pure Sodium Bentonite Indian Healing Clay Powder. Some background information on Bentonite can help you better understand the benefits of using it depending on your particular skin type. Bentonite Clay is composed of aged volcanic ash, and it's name comes from the home of the largest deposit of it in Benton, Wyoming. 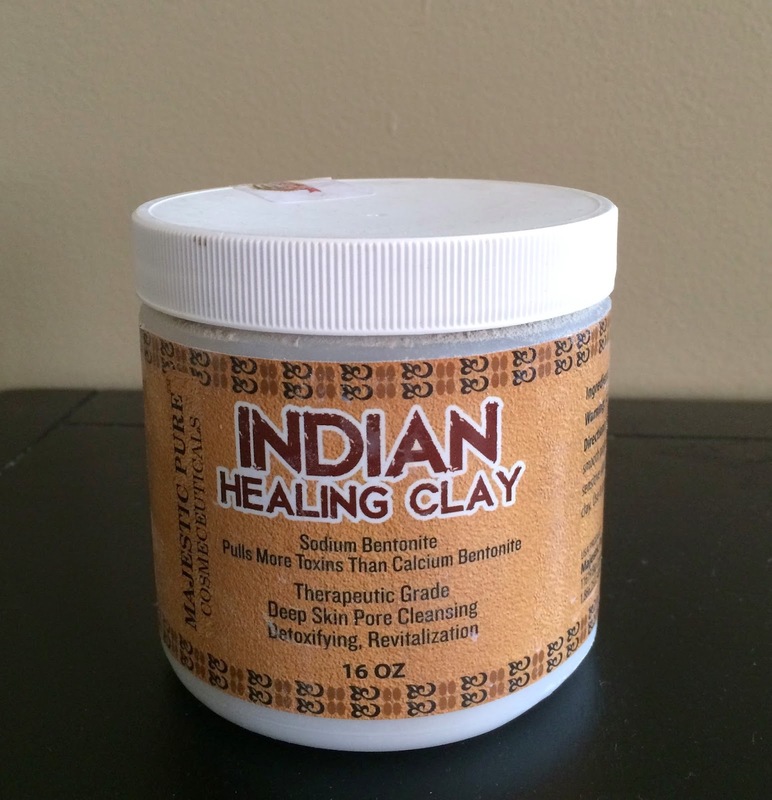 There are several variations of Bentonite Clay depending on the main element found within it. The most common varieties include: Sodium, Calcium, Potassium and Aluminum. The Majestic Pure Cosmeceuticals 100% Pure Sodium Bentonite Indian Healing Clay Powder, obviously is of the sodium variety. This particular variety is known for it's ability to absorb several times it's weight, which makes it a staple in any skincare regimen to keep those pores clear of chemicals, toxins and heavy metals. Because Bentonite clay is has a highly negative charge, it works to really draw out toxins, which tend to be positively charged. The Majestic Pure Cosmeceuticals 100% Pure Sodium Bentonite Indian Healing Clay Powder comes in a HUGE 16 ounce tub, which gives you a TON of product to work with. I use it as a face mask and a small amount really goes a long way. You mix three parts water to one part of the clay, and for most faces, 1 tablespoon of clay mixed with 3 tablespoons of water will do the trick. Plus, it is recommended to use once per week, meaning this tub will last you a truly significant amount of time. If you do a quick internet search, you will be able to find a plethora of recipes for face masks that use Bentonite Clay as an ingredient. This way, you can find one that fits your desired outcome. I love using this as a mask, as it leaves my skin soft, supple and detoxified. It dries up all of my blemishes and allows my skin to heal. While I have only used this as a mask mixed with water, I am anxious to try another variety with activated charcoal, aloe vera and organic apple cider vinegar. This Majestic Pure Cosmeceuticals 100% Pure Sodium Bentonite Indian Healing Clay Powder also has a ton of other uses too. You can use it on insect bites and stings, as a detoxifying bath or foot soak, as a clarifying treatment for your hair, and I have even heard of people using it in some form of a toothpaste. This product is very versatile and handy! If you too would like to get your hands on a tub of some very high quality Bentnite Clay, I hghly suggest you run HERE to grab the Majestic Pure Cosmeceuticals 100% Pure Sodium Bentonite Indian Healing Clay Powder. It currently costs $12.95 for a 16 oz tub, and it is backed with a 100% satisfaction guarantee. You have nothing to lose! My husband is big into outdoor stuff from ice fishing and snowmobiling to hunting and four-wheeling. He is very much an outdoorsman, and one thing that he is always certain about is safety. There are always a couple of items he will not leave the house without, and one of them is a flashlight. I think we probably have 30 laying in random places around the house, which is great for power outages, but otherwise, semi-annoying. Either way, I thought I would add to the chaos when I agreed to review the AYL 3-in-1 Cree LED Flashlight with Magnetized Base. This thing is GREAT! First of all, it is a pretty decent sized flashlight being 8 inches long. In my opinion, it is the perfect size to keep in the car, or on the nightstand. If you choose to keep it in the car for roadside emergencies, it has a magnetic base, which allows you to stick it right onto the side of your car. This can help make yourself more visible on the side of the road, or provide light if you are needing to look at or fix something. 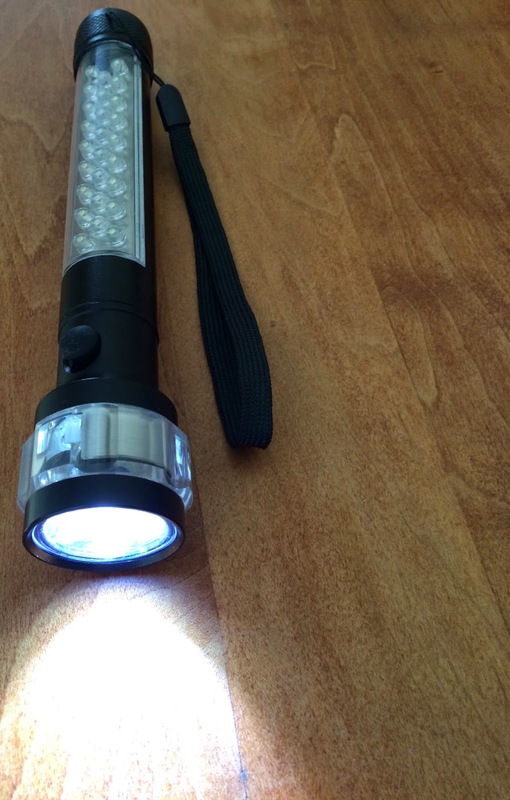 What makes this a 3-in-1 flashlight is the fact that it can be used as a cree LED light (you know, a regular flashlight), the 18 side LED lights, or it lights up and flashes with red lights. Each tap of the power button guides you through the three options in that exact order. The AYL 3-in-1 Cree LED Flashlight with Magnetized Base is also helpful if you are outdoors a lot and need a reliable source of light, or a way to signal distress. 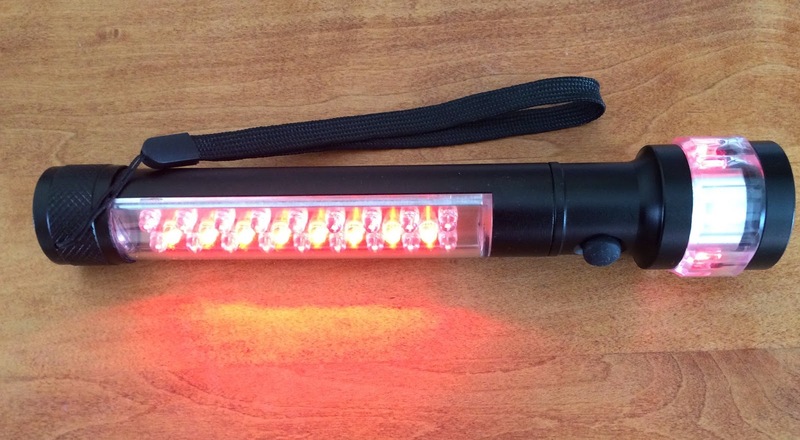 The body of the flashlight is made from Anodized Aluminum, which is resistant to the elements making it the most durable and versatile flashlight in your arsenal. It also is armed with 29 LED lights, 18 of which are white, and 11 of which are red. These bulbs are built to last for 100,000 hours, so you should be set for quite awhile. Plus, this runs off of 3 AAA batteries, which most have laying around the house. In my experience, this product has a purpose in any home. 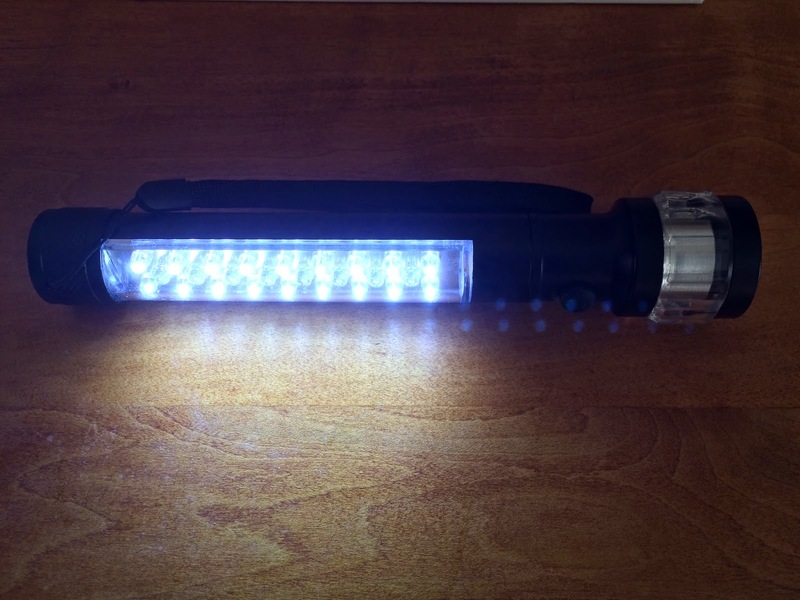 Whether you simply use it as your go-to flashlight, or in the event of a car emergency, or for your outdoor needs, it lends it self to a wide variety of uses. If you are in need of a multi-functional flashlight, or a good gift idea for those "tough" ones on your list, I recommend grabbing the AYL 3-in-1 Cree LED Flashlight with Magnetized Base from Amazon HERE. It is currently priced at a very reasonable $19.99, and as always, this price is subject to change at any moment in time. For all of you liquid foundation wearers out there, how do you apply it? For the longest time I used some combination of those wedge sponges and my fingers. That is, until I was introduced to that beautiful place that starts with an "S" and ends with an "ephora". I was on the search for a high end full coverage foundation, and they color matched me by applying the foundation to my face with a brush. I must've been under some kind of rock to have never done this before, or even really heard of it, but rest easy people, I get it now, and I won't go back! My latest review features a really beautiful Y19 Foundation Brush from Yalmeh that is now my go-to brush for liquid foundation application! How pretty is this brush?!?! I think she is gorg! Plus, it is made from high quality materials, including top grade synthetic fibers which grant you the ability to use and wash frequently without shedding. There is nothing worse than a brush that sheds. On top of that, this brush is hypoallergenic, cruelty-free and vegan friendly. I'm very respectful towards companies who take measures to ensure that their products do not harm animals. The pearly-white handle is made of wood, so it is strong and sturdy to support optimal control as you apply your make-up. While I use this specifically for liquid foundation, it can be used for blush, powder or setting powder as well. The main reason I love this Yalmeh Y19 Foundation Brush so much is the tapered head. It allows for me to get foundation blended thoroughly, even in those difficult areas like the sides of my nose or under my eyes. This brush is also dense which makes coverage a breeze. One of the biggest issues I used to have with those little wedge sponges is that it absorbs half of the make-up, and then gives you very minimal coverage. As a blemish-sufferer, I need coverage, and because I spend a decent amount of money on my foundation, I don't want it being sucked into a sponge - I need it on my face! This brush also washes so well. I often hesitate to wash brushes I enjoy because some of them just never go back to their original perfect-ness. I tend to wash my foundation brushes more often than others because they are used so regularly, and all over my face, and I am happy to say that this one has given me zero issues! If you are new to foundation brushes, or new to make-up in general, I would definitely recommend grabbing one of these brushes from Amazon HERE. They retail for $29.95 but have been on sale for $11.95, which is a steal of a deal! As always my friends, these prices and availability are subject to change. If you are interested in more of their products, you can check out the Yalmeh website. As I look out my window I see the FEET of snow on the ground that have accumulated over the past two weeks. In my head, I dream of warm weather, sunshine and water. Wishful thinking, I know. I don't hate Winter or snow, but I don't love it after Christmas. By the time Spring rolls around, I embrace the more tolerable temps and the frequency of seeing that burning ball of fire that is the sun. One thing that I always start researching around this time of year is sunscreen. I like to have myself stocked up before the warmer weather arrives so that I am prepared. I take very specific precautions with what we use to protect ourselves from the sun, so most of the time I order the products offline and stock up to ensure there are no sun-related emergencies that would lead to me having to buy something unsafe. Read the labels on your sunscreen, and understand what the ingredients are - you may be terrified at what you are slathering or spraying onto your body, or even worse, onto your children's bodies. While they may protect your family from sunburn, they may also contribute to toxic levels of chemicals. I'm LOVING this new Sun 'N Fun Broad Spectrum Mineral Sunscreen made by Sweetsation Therapy that I recently got to try! First and foremost, this Sunscreen is made with natural and organic ingredients. We often forget that our skin is our largest organ; Any and everything that is put on it should be thoroughly considered, as it gets absorbed into our bodies, where our organs are. 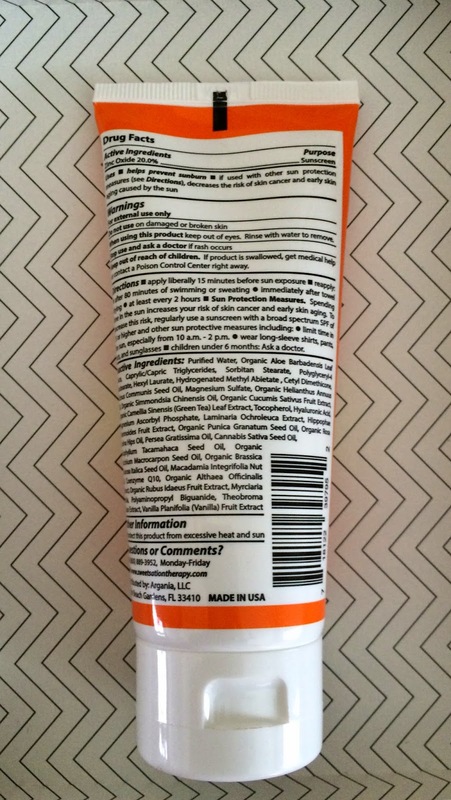 Being a mineral sunscreen, the active ingredient is 20% Zinc. This is much safer than the unpronounceable ingredients in many other readily available and cheap alternative n the market. 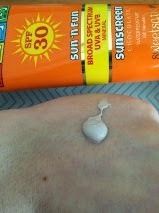 I have tried a slew of mineral sunscreens and one of my biggest complaints is the white "glow" it leaves behind. Very few are non-greasy, and most literally leave you looking like a porcelain doll, after you spend an hour rubbing it in. The Sun 'N Fun Broad Spectrum Mineral Sunscreen does none of this! It is simple to rub in, absorbs completely, and leaves no evidence behind. Another complaint I have of other natural sunscreens is the scent. Many claim they are non-scented, which is great, but sometimes "unscented" has a scent..... and I don't like it. This Sun 'N Fun Broad Spectrum Mineral Sunscreen smells like chocolate and marshmallows! I mean, does it get any better than that? I know this sunscreen is made for the kids, but it will be used by the entire family, for sure! While I cannot attest to how well this works at preventing sunburn just yet, I have no reason to believe that it will not work. I have used many sunscreens whose active ingredient is zinc with great success. I'm excited to be starting my sunscreen hoarding shopping early this year, and I know the kids will be begging to put this on. I appreciate that it is made in the USA too! The formula is moisturizing, which I have such an appreciation for because I have a true pet peeve about dry skin, and some mineral sunscreens are very chalky, making it feel like it is pulling away all of your moisture. Not a fan! If you want to get the ball rolling on your skin protection for the Summer, or if you are lucky enough to live where the sun shines year-round, you should really grab some of this for yourself and the kids. It is currently $19.48 on Amazon, although that price is subject to change at any time. They also offer a unique variety of products that you can check out on their website, while keeping current with them on Facebook and Twitter! For the Finest Looking Coffee, Get a Frother! I'm a coffee addict. Literally, I get to a certain point every evening where I start looking forward to my morning cup of coffee the next day. NOTHING gets done until I have my first cup of coffee in the morning, and for the most part, I'm not fully functioning until my second cup is in me. I'm mostly a morning coffee drinker, but there have been times where I have made, or drank it in the middle or end of the day. And of course, I love to treat myself to coffee from specialty shops because, lets face it, it's prettier! 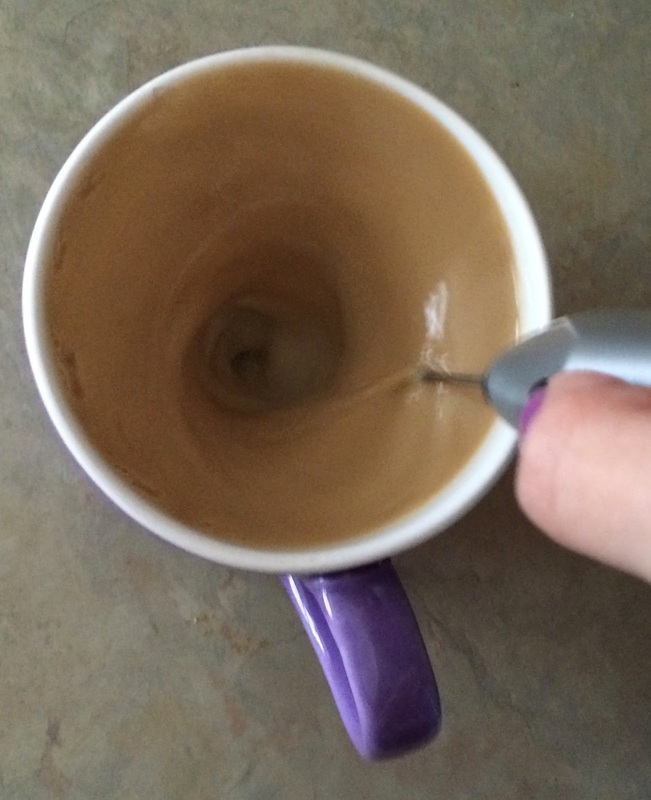 I recently was given the opportunity to review the MatchaDNA Handheld Wireless Milk Frother, and it has become an instant favorite around the kitchen and for my morning coffee! The MatchaDNA Milk Frother does exactly what it was created to do, and froths milk. I have tried it with several beverages just to give it the ultimate test. It gives you a beautiful froth for your coffee and cocoa, it works great to mix up chocolate milk for the kids, and I even used it with my son's vitamin drink which can sometimes be gritty. I love that it also thoroughly mixes too. When you first look at it, it looks a tad like a mini cattle prod. You will need 2 AA batteries, which are inserted into the handle. When you slide the on/off switch forward, the stainless steel shaft and whip at the end will rotate rapidly! It's definitely a strong little thing. In order to operate the Matcha DNA Milk Frother, you insert the frother into a cup of hot or cold milk that is 1/4 full. 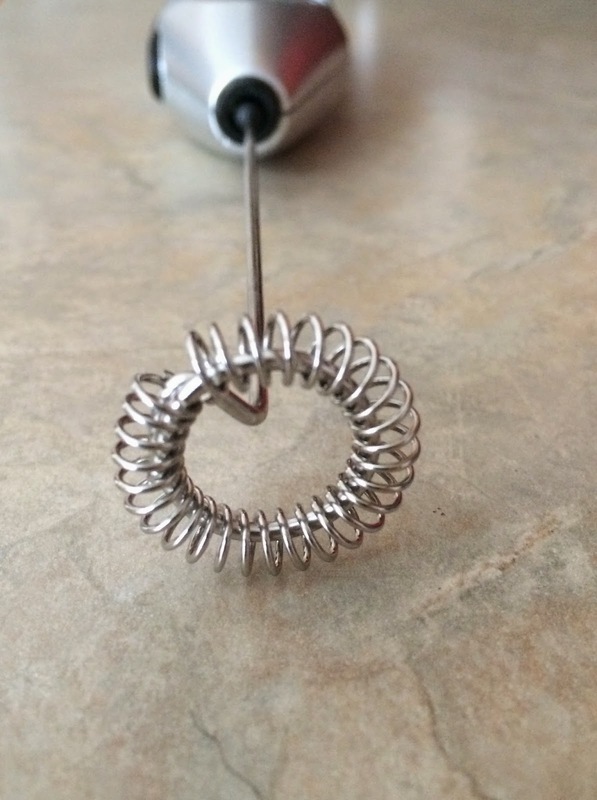 Hold the frother at an angle and turn it on. Slowly and carefully move it up and down for only a few seconds. Viola! You have frothed milk! Those are the direction provided by the company. I, being the rebel that I am, tend to just stick it into whatever needs frothing, and let it work. It works well that way too, but beware that if your cup is too full, it will spill over the sides. Their directions are definitely better in that respect. I tend to jut pulse it to avoid any liquid spilling out. As you can see, it adds a nice flair to your hot beverages, so you can be sure to give yourself and guests a true treat. As I mentioned previously, this also works very well as a drink mixer. If you use a powdered mix for shakes, flavored milk or protein beverages, this also works flawlessly to do that, and you get a little extra foam on top! Plus, the kids think this thing is super-cool! If you are wanting to bring some frothy-ness to your hot and cold beverages, this is a superb and highly affordable way to do so! Right now, you can grab this for $6.25 on Amazon HERE. As always, this price is subject to change as is any Amazon price. However, the regular price is $8.89, so still reasonable, and affordable! This Milk Frother is also backed by a 60 day money-back guarantee, so you have nothing to lose if you are not a fan. Feel free to see what else Matcha DNA has to offer on their website, Facebook and Twitter pages. Alright, I am skeptical of most "trends" that this world concocts, however, there are a few that I try and end up falling pretty hard for. I, just as everyone who has eyes, knows how to read, and participates in any form of social media, know that essential oils are a "thing" right now. Everyone is coming out of the woodwork and swearing that they are curing their chronic illnesses, making their homes smell glorious and even keeping their families safe from the flu. I'm not a doctor or medical professional, so I cannot attest to whether or not the oils are capable of such things, I am simply a consumer who reports on my personal experiences with such things. 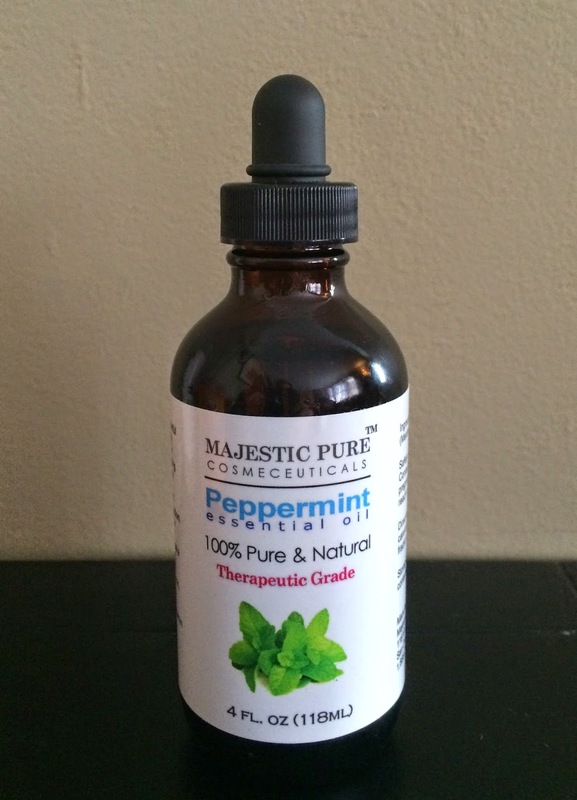 First up, I am going to review Majestic Pure Cosmeceutical's Peppermint Essential Oil, which they sent me to test out. Because I am relatively new to essential oils, the thought of ingesting them still scares the ever-loving beejesus out of me, so I am finding other uses for them until I get more comfortable with that. In fact, the bottle specifically says that this is for external use only, it also says to keep away from children. I understand that essential oils can be potent and dangerous which is why I keep them in a safe place, out of reach, and use them VERY sparingly. Safety first, last and always in this house! I also know that many "warnings" are there so that companies cannot be held responsible for possible reactions, side effects, and/or misuse due to human error and not the product itself. Relief for symptoms related to heartburn, indigestion and irritable bowel syndrome. Can assist when dealing with nausea, vomiting, diarrhea and gas. Helpful for colds, coughs, sinus infections and inflammation of the mouth and throat. Great for use when experiencing headaches, muscle aches and toothaches. It also can work as a bug repellent to keep those pesky bug out of the house, or off of you! *The Majestic Pure Cosmeceuticals Peppermint Essential Oil claims to be 100% pure and non-toxic, which suggests that it can be ingested, but it warns against doing so. For the most part, when aiming to address the aforementioned ailments, you get the best results when you use it with a carrier oil and either rub it on the bottom of your feet, rub it on the stomach area, or any place near the area of distress. Sometimes just smelling it can help with certain things like a headache or nausea. As I mentioned in a prior post, I wanted to use the Peppermint Essential Oil in combination with the Fractionated Coconut Oil to create a toothpaste. To try it out I mixed together 1/2 tablespoon of baking soda, 1/2 tablespoon of Fractionated Coconut Oil and 5 drops of the Peppermint Essential Oil. It was a tad watery so I added a few more sprinkles of baking soda until it was a little thicker. I have to say that it was a bit strange. I'm not quite sure whether I am a convert yet, but it absolutely made my mouth feel fresh, and the peppermint was not overwhelming though I suspected it would be. It tastes heavily of baking soda so I know my kids wouldn't use it, however, I have seen other recipes which use stevia as a sweetener, so that would be worth a shot too! I made sure to rinse my mouth out thoroughly after use as well to ensure that the peppermint oil was not ingested, as it is therapeutic grade not food grade. My kids just recently caught a little cold with stuffy noses and congestion. I have read that the cool mist humidifiers that do not use filers can also work to diffuse essential oils, so I added a few drops of peppermint and lemon essential oils to the humidifier as a way to help break up their congestion and add a pleasant smell to the room. This also makes me feel like it is cleaning out the humidifier, as many essential oils help fight against bacteria. Again, I can't make claims as to essential oils "curing" anything because the FDA says I can't, but I can say it didn't hurt! If you are interested in jumping on the essential oil bandwagon, Majestic Pure Cosmeceuticals Peppermint Oil is a great place to start, and is very affordable. You can grab a very large 4 ounce bottle for $14.95, HERE. Prices on Amazon fluctuate often so there is no guarantee that this price will last. You can also see what other products the brand offers on their website and Facebook. One of my favorite things about reviewing products is getting the opportunity to try products that I would never otherwise even know about. Take, for example, this product: the Organic Seeds Sprouter from Vremi. To be honest, I initially thought this was similar to a mini herb garden except to start sprouts indoors before moving them outdoors. Because of our harsh Winters and questionable Springs, you never know when you'll be able to plant anything directly into the ground, so most of the time we start our seeds indoors. And I like to keep fresh herbs growing in the house for cooking purposes. 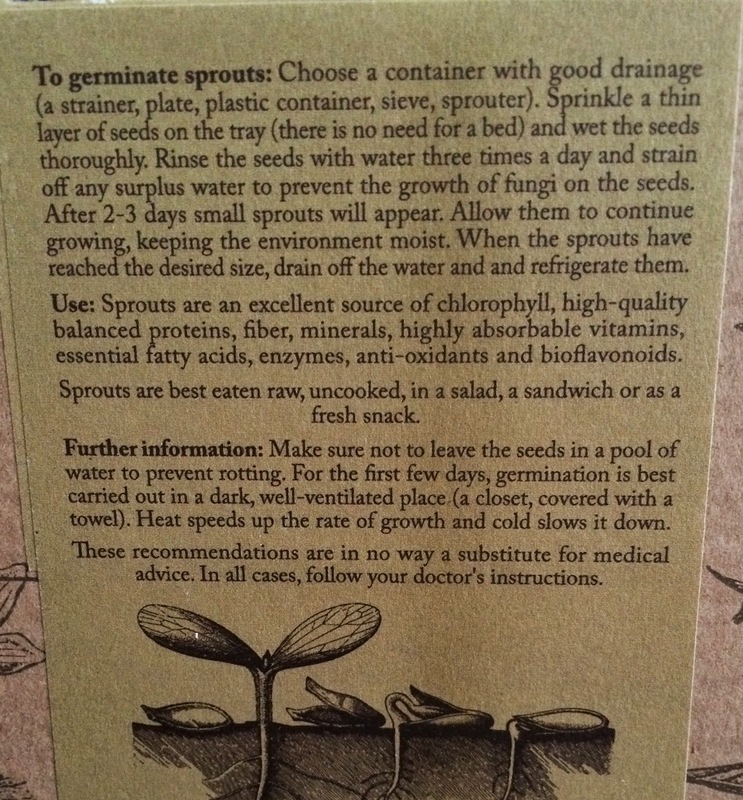 Come to find out, this is actually so you can grow your own sprouts! I am a fan of sprouts, so this worked out well! First of all, how cute is this box?!?! It is sturdy and adorable, and could totally be re-purposed! These would make a truly thoughtful and unique gift for the gardener or the "greenie" in your life, or if you know someone that just REALLY loves sprouts. I'm a fan of sprouts. I like to add them to sandwiches and salads, and sometimes, just on their own. 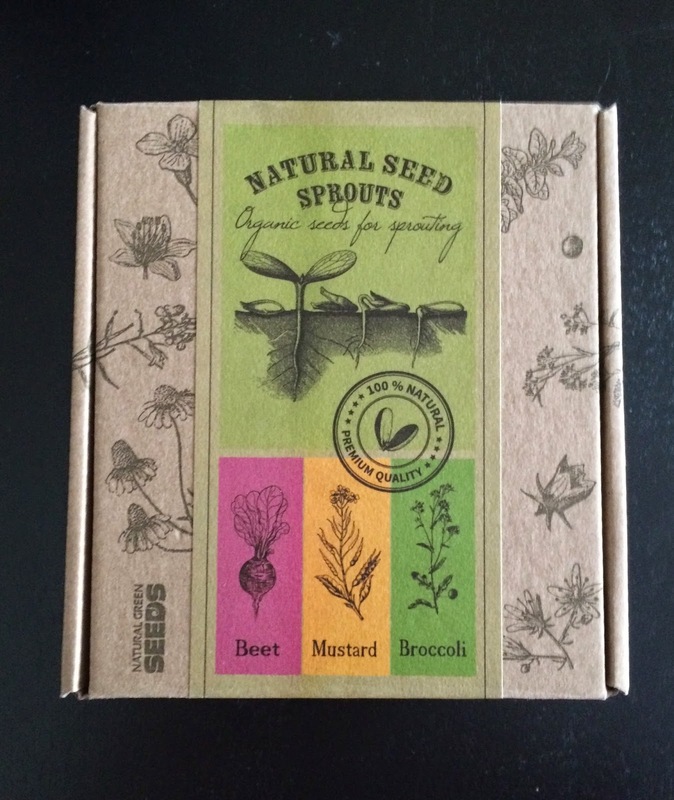 This fun Sprouting Kit lets you grow 3 different varieties of sprouts: beet (with earthy flavor), mustard (with a spicy flavor) and broccoli (with a neutral flavor). As you can see, there is a bit of dedication to properly germinating and harvesting the sprouts, with needing to rinse them 3 times per day, but the results pay off quickly, as they begin to grow after only 2-3 days. If you have ever grown any type of seed, you know that keeping them moist is important, but can also be difficult to keep bacteria (in the form of mold) from growing. You have to keep a close eye on them to ensure the best results. Once I have pictures of them at all stages, I will post that too. Excuse my tardiness, but I am loving how Amazon lets you get a free $1 of media credit if you choose no-rush shipping, so my packages take a little longer to get here. On the plus side, I get to read more books so I'm alright with it! This makes a creative and thoughtful gift idea, great if you enjoy consuming sprouts, and even fun to do with kids because they really get to watch it grow without the soil. My son is in fourth grade which is when they study the growth of plants a little more in-depth, so this makes it extra fun for him (and educational too!). If you are looking to purchase a Sprouter Kit, I would highly recommend this one, as it comes with a TON of organic, non-GMO seeds and only costs $17.90, HERE (this is the current Amazon price, and it may change as their prices fluctuate often).